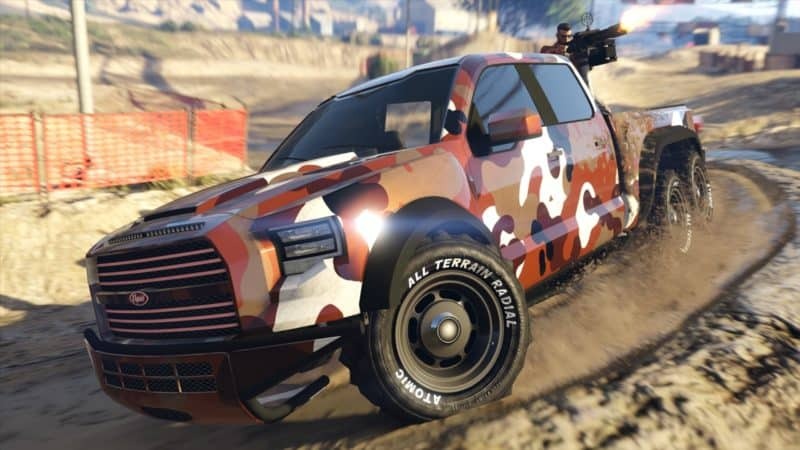 Grand Theft Auto Online’s newest weekly content drop introduces one mean looking vehicle that impotent rednecks will salivate over, as well as an all-new Adversary Mode focused entirely on said vehicle. As usual, there are also a bunch of discounts on offer to help you decide what to blow your hard-earned virtual cash on, because owning more stuff is the true road to happiness. The new Vapid Caracara is an absolute beast of a vehicle. A four-door 6×6 pickup truck with a machine gun strapped to its rear, this car screams “compensating” from miles away. Based on the Ford F-150 for design cues, this ride has been very heavily modified compared to the source material. It’s huge, it’s armed and it’s loud. The Caracara may look like an overdesigned machine, it certainly has its uses for crews looking to transport troops while also defending them. The Caracara has somewhat limited customization options, and it isn’t a performance vehicle – the point here isn’t to be quick, or to have great acceleration, but rather to be imposing and kill the competition with the MG jutting out of the bed. No-one should be racing with one of these, but then no-one races in the off-road class anyway, because why would you. If nowhere else, size certainly does matter when it comes to paying for stuff, and a huge beast like the Caracara will cost you – GTA$ 1,775,000 to be exact. If you want to take this vehicle for a spin to test it out before dropping such a substantial sum, Rockstar has just the thing for you – the all-new Target Assault Series Adversary Mode. The tracks in this mode will see teams of two riding a Caracara or another weaponized vehicle, one player driving, the other manning the turret. Races consist of three laps, with the positions being switched each lap. The driver needs to make sure to outpace the opposition and hit the finish line first, while the gunner needs to rack up points essential for victory by shooting targets throughout the map. Target Assault will require communication and teamwork. Between being the quickest and the most accurate, the latter will score you more points, so if going a tad slower to help with the aiming means hitting more targets but not hitting the checkpoints first, the tradeoff might be worth it. However, if the gunner can keep up their end, then you can earn valuable bonuses if you push the pedal to the metal. As always with new modes, Target Assault will be paying out double RP and GTA$ this week. A host of items in GTA Online are also on discount. All vehicles on offer this week share a 30% discount, and these include the Mammoth Avenger, a flying fortress introduced in The Doomsday Heist, the Turreted Limo, the HVY Barrage, the Karin Technical and Technical Aqua, the Brute Armored Boxville and the HVY Insurgent. The Weapon Workshop add-on for the Avenger, and styles for it are also 30% off, while the vehicle workshop for the same vehicle and for the MOC are 50% off. Additionally, there is a 25% discount on all brakes, engines, liveries, transmission, turbo and vehicle armor.